Hapless reporter avenges his date’s death only to find the body count building. Will Mitch Malone get his exclusive before he is featured in the obituaries? 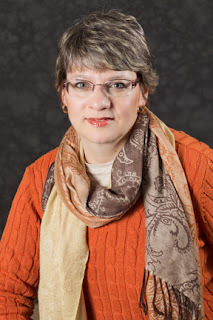 I'm thrilled to welcome my friend and mystery author, W.S. Gager, to the J.Q. Rose blog. Wendy just released her fourth book in the Mitch Malone Mystery Series, A Case of Volatile Deeds. We are swapping blogs today, so click on over to Wendy's blog to take in Mitch Malone's interview of Pastor Christine. Oh yes, he's always looking for a story! Mitch Malone finally scores a weekend dinner with a cute receptionist, but true to his reporter instincts, an explosion in a high rise office building makes him stand up his date as he runs for an exclusive. Mitch learns that much of what he knows about his date and her work aren’t what they seem. His world continues to twist when the police captain asks for his help and a city hall informant is found floating in the river. Mitch must keep his head down or a cute dog with a knack for finding dead bodies will be sniffing out his corpse. Wendy is here today to let us in on some of the research she did for her latest release. In A CASE OF VOLATILE DEEDS my crime-beat reporter/sleuth is given a dog by an anonymous source. Mitch is not a good person to take care of a pet and tends to forget everything but the story he is working on. This creates some complications for him especially when he has a female guest but the dog, a cocker spaniel named Molly, quickly proves her worth as she has an odd skill—she sniffs out dead bodies. I did a bit of research on dogs and their noses. These specialized animals are called cadaver dogs and are used to locate dead bodies from killers, lost hikers or avalanche victims. According to an article by two Miami Dade Police officers, in the last ten years these dogs called Human Remain Detectors and can distinguish between human remains, animal remains and other scents in various locations despite a criminal’s attempt to hide them. Most cadaver dogs require training but Mitch’s Molly comes by the skill rather by accident. Mitch grumbles about having to take the dog for a walk for her basic necessities. The first body she finds is in the middle of the night and has washed up along the river. The second body she finds is buried at a construction site and it really makes Mitch think about her special talents and how it helps him find his exclusives. However, it makes the police a little suspicious when he finds two bodies within a 24-hour period. Molly sniffed along the base of the sand pile and my impatience grew. “Come on,” I yelled. I just wanted her to do her business and come back. I did have a job to do. With my seniority and stories, I didn’t have to punch a time clock but it was Saturday night in the big city and I had crime to follow up. I needed answers to make sense of Tasha’s death. Then, thanks to Molly’s bodily functions leading to the discovery of the body that washed up on the river last night, I made a mental note to get an identification and cause of death and hoped it wasn’t the man Donna asked about earlier. Molly did a little circle and then started pawing the ground. needed to get going. This wasn’t her personal sandbox where she could get her digging fix. She barked again and again and then dug. Had my dog been possessed? When had she become my dog? That thought stopped me. Did I want a dog? Could I take care of a dog? Did I really want to keep her? No. I wasn’t made to have pets and certainly not a dog who needed to be walked all the time. Not Mitch Malone. My motto was no entanglements. Unbiased observation of the human condition. Reporter extraordinaire, not parent to a pet. Nope. No way. Wasn’t going to happen. I heard a muffled yip and brought my attention back to Molly. The dirt stopped piling up behind her and she turned, something in her mouth. I rubbed my eyes to make sure I was seeing correctly. Molly held a pant leg with a shoe hanging out the end of it. Award winning mystery author W.S. Gager has lived in Michigan for most of her life except when she was interviewing race car drivers or professional woman's golfers. She enjoyed the fast-paced life of a newspaper reporter until deciding to settle down and realized babies didn't adapt well to running down story details on deadline. Since then she honed her skills on other forms of writing before deciding to do what she always wanted with her life and that was to write mystery novels. Her main character is Mitch Malone who is an edgy crime-beat reporter always on the hunt for the next Pulitzer and won't let anyone stop him. Her third book, A CASE OF HOMETOWN BLUES, was a finalist in the 2012 Daphne Du Maurier Award for Excellence in Mystery/Suspense. 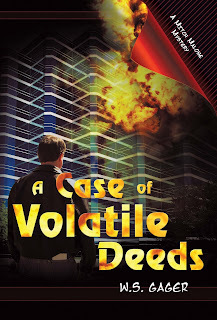 A CASE OF VOLATILE DEEDS is the latest in the Mitch series. JQ: Thanks for letting me visit. Can't wait for your return to the land of the north! Reading this now. Definitely one of Gager's best! Thanks for the info on the cadaver dogs...and for the excerpt. Sounds like another great Mitch Malone story, W.S. Stephanie: you are a true Southern peach. Thanks for all you have done! Wendy, you're welcome. Interesting article on the dogs. Joselyn, it's a great story for sure. Thanks for stopping in. Stephanie, Mitch is quite a character for sure. I've enjoyed the Mitch Malone series too. Thank you for visiting. I agree with Joselyn. They just keep getting better! Hi Tess. Indeed they do! Thanks for stopping in.! !